Terri and her producer Jacqueline sit down over a cup of coffee to reflect on how they plan to start 2018. For them it’s not about the resolutions. 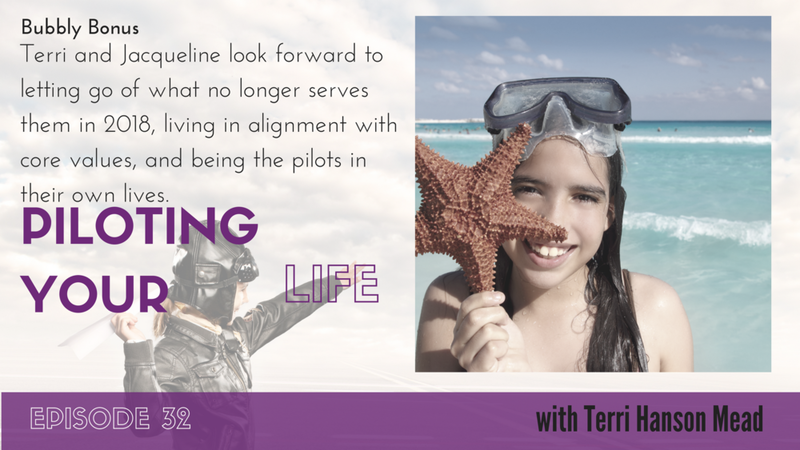 They discuss letting go of what no longer serves them, living in alignment with core values or noble goals, planning and productivity tools, and being the pilots in their own lives. Living in integrity means that there is no friction and its effortless. The definition of integrity is when your words and actions match, and are in alignment with your commitments, values, beliefs and life vision. A ship in harbor is safe but that’s not what ships are built for. Be your best self. Define your core values or noble goal/life purpose. Make your decisions consistent with these values/purposes. Let go of what no longer serves you. Stay focused on the bigger picture. Take one step at a time and path will present itself. Have faith and trust. You can follow Jacqueline on Twitter at @jacquelineStee or find her on her website at www.jacquelinesteenhuis.com.